Among the more noteworthy names emerging over the course of the 2016 festival season is Throttle. Following his Oliver Heldens collaboration, “Waiting,” the Australian DJ/producer has become a fixture of the festival circuit for his unique blend of house and disco. Throttle, whose real name is Robbie Bergin, continued to defy norms when his latest track, “Money Maker,” was selected to be released through Spinnin’ Records. Being that it wasn’t a typical progressive house track, it makes for an unexpected departure for the label. By the sound of things, Bergin does not intend to bend his style towards more mainstream genres, either. When we met up with him before his first ever set at Electric Daisy Carnival Las Vegas a few weeks back, he spilled the beans on his long-term plans to incorporate live elements into his performances. Aside from that, Bergin talked about his friendship with Oliver Heldens, his stylistic evolution, and an upcoming collaboration with Atlanta DJ/producer Niko The Kid. Take a look below, and enjoy. Welcome to Las Vegas! I understand that this is your first time playing EDC, right? Throttle: It is, yes. First time in Vegas and doing EDC. I mean, I did EDC New York. Other than that, I’ve never done an EDC before. It’s pretty surreal walking around. First and foremost, I have to ask about “Money Maker.” When I first heard it as an ID that popped up in one of Oliver Heldens’ sets, I thought, “That sounds a lot like his Throttle collaboration,” and it turned out it was your track! How did the track come together and when did you first come into contact with Heldens? Throttle: I started on it about a year ago when I was working on “Waiting” with Oliver. I was going back and forth with a Spinnin’ A&R, and had all this feedback from the Heldens track. I tried 50 times to get it right and it wasn’t right, but I was making this track, “Money Maker,” which was an idea I did for fun in a couple days. I had a SoundCloud set of about 15 tracks, and I wasn’t signed to Spinnin’ at the time, but I sent it over to Spinnin’ just to say, “If you like anything let me know.” “Money Maker” was the last one because it was just something that I whipped up quickly, and they said, “We love “Money Maker” and we wanna sign you,” which was pretty cool. I finished that up, and Oliver and I had been giving each other feedback on stuff for years, so I sent it to him and he gave me lots of feedback, and started testing it out on the bus tour that I do with him. He premiered it as an ID, which has really built it up for the release, which is great. Right, and that was your Spinnin’ debut, correct? Throttle: Well, yes, my solo Spinnin’ debut. Spinnin’ Records is known for a much more mainstream sound. Do you think they’re trying to rebrand themselves, or are you just an exception they’re making? Throttle: It’s hard to tell. They’ve never really released something like “Money Maker” on the main Spinnin’ label. They started a lot of sub-labels to release new music, like Spinnin’ Deep and a lot of their artist labels which stand for different sounds, but for me it was amazing that they picked it up and wanted it on the main label. I think for them it’s a big risk, and it’s cool for them to take that risk as they’re such a trendsetter. They have such a big fanbase and it’s cool that they wanna change things up. It’s hard to tell if I’m the start of their new sound or they wanna try something different, but either way it’s pretty awesome. Well, something that you do have in common with some more famous Spinnin’ artists – like Martin Garrix and Julian Jordan – is that you started when you were 16. Throttle: Well, it was 14, really. I started DJing at 13 and producing at 14. Right, but your big break, “Next Big Thing,” was at 16. That one sounds a lot different from, let’s say, the style that you’re being marketed for playing. How did you come to adopt more of the disco sound? Throttle: From day one, I loved the disco sound, and wanted to keep it groovy. When I started out there was a lot of electro house and big room, so when I started out there was more of mix of disco, big room, and electro – which you can hear in “Next Big Thing.” It’s funkier than a typical electro house track. Then, I sort of evolved from that into a progressive house/disco mix, and it’s gradually matured to a more classic sound as I’ve grown up and listened to more music – and now it’s more of a disco house sound, which, for me, is the best way to incorporate all of my influences, from rock and roll to house music to all that stuff. I find it really easy to put together in disco house music. 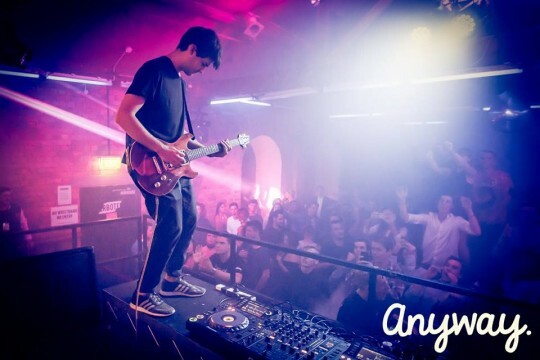 Australia has a very interesting emerging identity in the world of electronic music. A lot of what’s making waves comes from artists like Flume and What So Not, but there is also an undercurrent of funkier music. Have you found that your sound has a big place in Australia? Throttle: It’s tough to say. Australia kind of has two big markets, which would be the Flume/Future Classic sort of sound, and the big Will Sparks Melbourne bounce sort of sound – [the latter of] which is fading, but it’s still one of the big things there. It’s interesting when I play there. Obviously, some of the crowds don’t quite get the disco house thing yet. It’s hard to tell. Different cities seem to be different worlds. Australia’s a funny one; there are so many little submarkets. I feel like house music is blowing up right now all over. On a personal note, I have to bring up that your very first Dirty Disco mix had a remix of a song called “All That She Wants” by Ace of Base. As silly as it sounds, if I had to cite a song that got me into music that would be it. I literally had my babysitter put it on a mixtape for me – like, an actual cassette. I wanna ask you, if you had to trace it back, what’s the first thing that got you into music? Throttle: Seeing Justin Timberlake live back in 2007, I think. It was the first live show I ever saw, and you don’t necessarily hear it in my music, but my vision of where I wanna be is really based on that. The live show that I wanna have in the next 5-10 years is sort of traced back to that. He had everything in that live show, like live performers, and the session musicians are obviously second to none with Justin. The session players, the singing, the dancing, the lights, the engagement of the crowd are all a big part of where I wanna go. Well, traditionally, disco has had a lot more instrumental samples. It sounds like a live show is something you’ve given a lot of thought; is live instrumentation going to be incorporated into it? Throttle: Definitely. It’s tough to say exactly how the live show’s gonna look, because it’s something that’s gonna gradually evolve over the next five years starting with me doing more live guitar, which I do at some shows, and then gradually bring in probably horns and singers first. It’s gonna be a slow evolution, I think, of the show. It’s a five-year plan you said, though, right? Throttle: Absolutely, and the music I’m working on might come in at this time, but there’s some real funk stuff that I need to save for after I do all of it. It’s hard to say, but live shows are definitely where I wanna end up. Well then, on the release front, what’s the future looking like for you? Throttle: It’s just so much music it’s crazy right now. The full vocal version of “Money Maker” is coming, and in about three to four weeks we have an insane music video. There’s a single I’m working on with Niko The Kid – he’s awesome. Also, a few solid tracks I’m finishing up right now, but I’m working on a lot of non-dance stuff as well. Pure funk stuff and more downtempo stuff. Yeah, I’m just sorta’ hiding away for now, but I’m focusing on more of the dance stuff. It’s going well; the next three are looking good. That concludes our interview with Throttle, but we would like to thank him very much for his time.